Come get a taste of what these two dynamic organizations have to offer! Representatives from Toastmasters will demonstrate public speaking. Get involved with your colleagues! 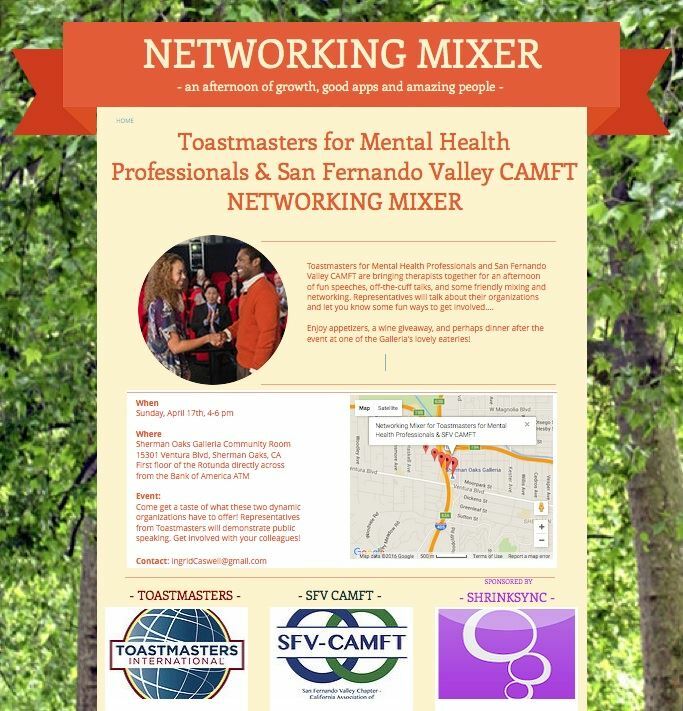 Toastmasters for Mental Health professionals and San Fernando Valley CAMFT are bringing therapist together for an afternoon of fun speeches, off-the-cuff talks, and some friendly mixing and networking. Representatives will talk about their organizations and let you know some fun ways to get involved. . . Enjoy appetizers, a wine giveaway, and perhaps dinner after the event at one of the Galleria's lovely eateries!